For the past three months, I have worked as an intern at the KB | National Library to form a collection of Dutch weblogs for the webarchive called the NL-blogosfeer (Dutch Blogosphere). During this internship I was guided by Peter de Bode, service coordinator web archiving, and Dr. Kees Teszelszky, conservator digital collections. Here I discovered that weblogs are an important primary source for historical research, because they place events in the context of their own time. Bloggers continuously focus on the current affairs. Many of the blogs are a bottom-up source: they give a glimpse in the daily life and opinions of the masses. 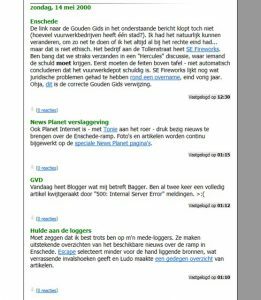 Blogs also show how the public reacts to current topics, such as election results, festivals, Pim Fortuyn (Dutch politician), #Metoo, changing fashions, reactions on 9/11, the earthquakes in Groningen and MH17. That is why it is interesting to research how regular civilians reacted on the internet to one of the greatest calamities in the Netherlands around the turn of the millennium: The firework disaster in Enschede. It was 18 years ago, last May, that a firework factory exploded in Enschede. That day 23 people died and about 950 people got injured. It happened the 13th of May 2000, on a Saturday: amidst the weekend. Because this catastrophe happened during the weekend, news about the disaster was slow and, in concerning traditional media, only present on radio and television. When searching Dutch newspapers at the newspaper database; LexisNexis on the 13th of May, and ‘Enschede’ there are only reports by the ANP (Dutch news agency). They wrote a total of 39 reports about the disaster between 4.30 p.m. and midnight. On the 14th of May, the ANP was, again, the only written source of information. It was not untill Monday that the news was released in paper newspapers. On the internet, however, it was a different story. There the bloggers were actively pursuing the news and so there you could find the latest updates about what was happening in Enschede, even on a Sunday. In his book Bloghelden Frank Meeuwsen has written extensively about the reporting by the bloggers concerning the firework disaster. He interviewed blogger Tonie for his book, who says this about reporting on the internet: ‘the disaster at the firework factory took place in the weekend. News websites at the time were not updated in the weekend. A lot of editors worked according to the old media principle (…) most online editorial offices closed on Friday and opened again on Monday.’ Tonie worked for the editorial office of Planet Internet at the time. There he was the first that worked the weekend shift. He was also working at the time of the firework disaster. He was not the only one according to Meeuwsen. Bloggers Alt0169 and Esc were also gathering news (that was scattered all over the internet) about the disaster and bringing it together on their own blogs. In order to research what Alt0169, ESC and Tonie wrote, we need archived websites. None of the three bloggers (their website as well as their archives) are online (live) at the moment. The webarchive of the Royal Library contains two of the three weblogs: Alt’s and Tonie’s. Unfortunately, on closer inspection both websites were archived too late and their blog archives are not approachable through the web archive of the Royal Library. For example, the following image is a message from the archive page from Tonie’s weblog on 13 – 19 may 2000. In it he says that his notepad (the title of the website is ‘Tonie’s notepad’) is now closed after three years and three months of writing, and that he is moving on. 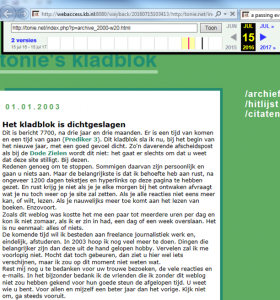 Screenshot Tonie’s kladblok from the KB | National Library Wayback Machine. (Viewing the webpage is only possible at the library). The only other source of information is the Internet Archive. Here, we can also find two out of the three bloggers: Alt and Tonie. Esc has an archive version of his website in the Internet Archive, but the archiving happened to late. 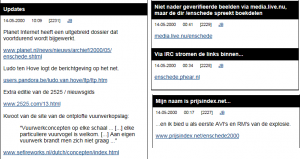 The oldest blog post I can find is from 17 juni 2000. In Tonie’s case, his website there is an archive (in het IA) with only one post about Enschede on the 14th of May. Other posts about the disaster follow on the 15th, 16th and 18th of May. On the 14th, Tonie refers to the webpage he was updating on the Planet Internet website. Unfortunately, this page was not archived by the Royal Library and was archived too late by the Internet Archive. The page was archived by the IA on the 15th of November 2001: the article was already updated to a version of the 8th of June 2001. What Tonie wrote the year before seems almost impossible to track down. 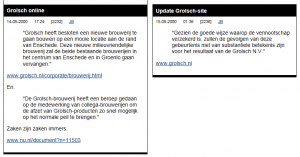 Besides regular news, Alt also writes some quaint newsmessages like about the reaction the company Grolsch from Enschede had on the fireworkdisaster, during which the Grolsch-factories had caught fire. It is impossible that this article was published on the 2nd of March 2000. The firework disaster took place on the 13th of May 2000 after all. The reason behind this mistake is that the Internet Archive archives only small pieces of a website. These pieces (which are archived on different dates) are put together afterwards like a puzzle for the user. The result is a fragmented webpage filled with pieces that do not match each other. Rediscovering old weblogs turns out to be problematic. Some websites can be found in the Internet Archive, but because of their fragmented archiving method the websites can be incomplete (like Esc) of even misleading (like twente.nl). Moreover, it is unsure if the right version of a webpage needed for particular research is even archived (like Planet Internet). The only way to find a complete as possible offline website is through internet archaeology. We have to search basements and old boxes to find old storage media containing versions of old websites. Internet archaeology can make sure that archives of weblogs are rediscovered so that we can discover what Tonie (through Planet Internet) and Esc wrote on the day itself about the firework disaster happening at that moment in Enschede. An example of what can (and will) be archived for the collection NL-blogosfeer is the blog belonging to L-rs. He was, just like Alt, online during the night from Saturday to Sunday to follow the news concerning the firework disaster in Enschede. Unfortunately all the hyperlinks to the news about Enschede have stopped working, but L-rs his archive is still online despite that the website is no longer active and has not been active for years. His opinions about (among other things) the events that happened in Enschede will be preserved by the webarchive at the Royal Library in the special web collection NL-blogosfeer for future research. I wanted to show with this research that archiving weblogs is complicated because of the many hyperlinks they contain. It is important that websites are archived in one go so that they make their way to the web archive as complete as possible. Additionally that I hope I have shown that weblogs are an amazing sources for close-reading. Weblogs are like the diaries of old and, because other people can react to them, it is possible to follow discussions about various topics. Weblogs will be an important source for future research when one wants to research how the public reacted to the current affairs. Hopefully, the web collection NL-blogosfeer can contribute to this. More on web archiving at Koninklijke Bibliotheek | National Library of The Netherlands can be found here.